With help from my many journals that I have kept throughout the years, journals that I often thought of putting a match to (yet each time, I place them into their box and up they go on the top shelf), I will be sharing reminiscences of my childhood growing up in County Clare. I will share a cavalcade of memories with you. There is a reason for everything. I will refer occasionally to the journals as I endeavour to share the ups and downs of a life so far well spent. At age two, my Aunt Mary, who was my mother’s sister, took me to live with herself, Uncle Paddy and my granny on their farm in Kilnacree in County Clare. This was my mother’s home place. This was to be only for a few months but, eight years later I was still living in my grannies, now with my Aunt Mary and Uncle Paddy, as granny had passed away. Going to Oatfield School with the local children was a long walk, crossing over boggy land. During the winter months the parents would rotate to convey us across the mountain to school and collect us again in the dark evenings. At age ten, mother thought it was time I came home to Galway and meet my two brothers and little sister. It was a big change and although I enjoyed the company of my siblings I longed for the thatched house the open-hearth fire and the neighbours who came in, in the evenings to sit around the turf fire and tell wild and scary yarns or stories. After a short while attending Briar hill School, my mother enrolled me in the Convent of Mercy School Galway based in central Galway. This was the school I attended until I was fourteen years old. Like many young people in those times, it was expected of us to leave school at the age of fourteen and find work to help with supporting the family. My luck came with finding work in the Agricultural College Athenry, where I stayed for three years. I had a flare for writing short verses on scraps of paper, saving them safely in a drawer. Emigration was rife in the country and America was the way forward and I too Caught that bug. Thinking that would be the end of my poetry scribbling, I dumped what I had written. I sailed for America in the 1950’s with hundreds of other hopefuls. I found myself once again scribbling a verse or two, which helped to still the loneliness for home back in Ballybritt. I married Michael Beggen, who was a native of County Monaghan. In time our son Michael Junior was born and five years later our second son, Leo came along, but after only seven and a half years of a happily married life, my young husband passed away. I returned to Galway a young widow with my two young sons. In time I met Paddy Dowling, a widower, also with two young children a son and daughter. In due course we married. This marriage yielded two pretty daughters. Working and rearing our six children our happy marriage ended after only nineteen years when the Lord called Paddy to himself. Once more I was a widow. Filling in my lonely time I continued writing poetry. I was a good storyteller and was invited on occasions by groups or club members, compiling a book to pen a short story adding it to their collection. I joined a creative writers’ class in the Ballybane Library, for a two-year course. At the end of this course, the class was encouraged to write a short story based on the Galway of today the book title was ‘GALWAY a CITY of STRANGERS’. My contribution was the changes I found in Galway on my return from America after eleven years. 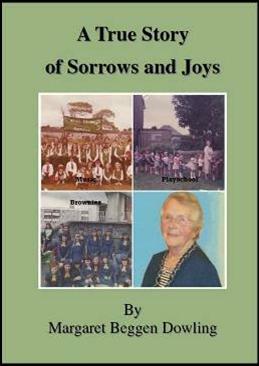 I also contributed to ‘WOMEN of OUR TIME’, and Ballybane Active Retirement’s Club Book, ‘DOWN MEMORY LANE’. I eventually compiled a book of sixty-one poems of my own work, ‘FIRESIDE NOSTALGIA POETRY’. Launching it in the Ballybane Library was an exciting day. After which I wrote a novel ‘FROM CLARE TO TEXAS’, this book took me three years to write. Following that came ‘A PATCHWORK of SHORT STORIES’, a selection of stories I wrote during a writers class I attended for a couple of years in Croí na Gallimhe, a resource centre in Mill Street Galway. Now my children are grown up and away from home I find sharing with like-minded people good company in a writer’s world. I was born in 1933 in the Central Hospital Galway the second child of a family of four. In those years there was usually one member of the family farmed out to be reared by relations, in our family, it was I.